One of the things I have found less experienced users of Pro Tools find confusing is the way playback behaviour can mysteriously change so that playback starts from an unexpected place on the timeline. This can be very frustrating but if I am asked why its “being weird”, it is often to do with the two buttons with the unfriendliest names in the edit window: “Link Timeline and Edit Selection’” and “Insertion Follows Playback”. While they don’t have snappy names, once you understand them you can finally feel properly in control of your session. There are two kinds of selections in Pro Tools: Timeline and Edit. A Timeline selection is a selected area of a timescale ruler (minutes & seconds, bars & beats, samples etc). 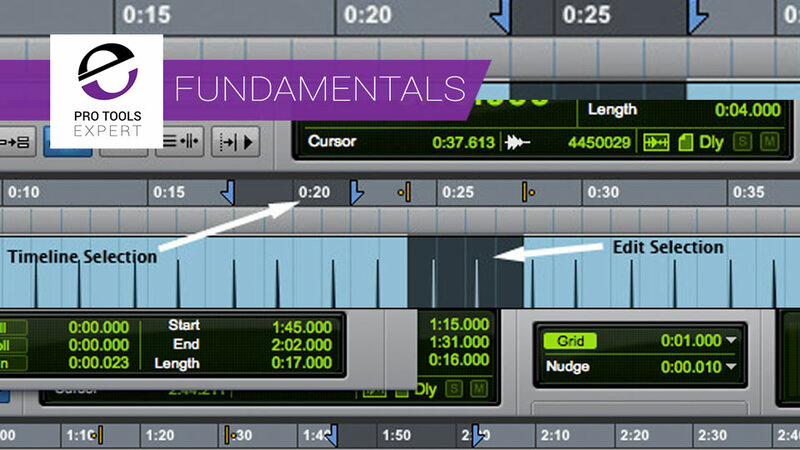 A timeline selection dictates where playback or recording will start and where it will stop or loop. It can be identified by a pair of blue or red arrows in the timescale ruler depending on whether any tracks are record armed. An Edit selection is a selection made on one or more tracks, actually on the track playlist itself. Edit selections control what audio or midi will be affected when making any kind of edit whether that is separating a clip, deleting, copying etc. The in and out points, when not obscured by the timeline selection arrows, are indicated by orange “pipe and a dot” markers. The most intuitive way of setting Pro Tools up is to link the timeline and edit selections so that whatever audio you select in the edit window will play because Pro Tools automatically creates a timeline selection to match any edit selection and vice versa. This means whatever you “point at” in the edit window will play, many users of other DAWs select exclusively in the timescale ruler and while this is perfectly effective, is unnecessary if timeline and edit selections are linked. To link edit and timeline selections either press the button below the Grabber or use the shortcut shift + /. I find I use Pro Tools with linked timeline and edit selections very nearly all the time. If you look in the toolbar display in the edit window you will see a large display of the current position of the playback cursor (more on this in a moment) and to the right of that, the start, end and length of the edit selection. You will find the equivalent info for the timeline selection in the transport window. If you click in the timeline without dragging you will create an insertion point. The insertion point looks like a blinking vertical line across the selected track. Playback starts from this point and a solid line moves away from the insertion point. This is called the playback cursor. It is useful to think of the insertion point as an edit selection with no length (i.e. the edit selection in and out points are in the same place or to put it another way, an edit selection is a “stretched out” insertion point). The “Insertion follows Playback” button changes the playback behaviour between two states. Unselected, playback begins at the insertion point, the playback cursor moves away to the right as the audio plays and when you press stop it returns to the insertion point. In this way you can repeatedly play from the same point over and over again. With the Insertion follows playback button engaged the insertion point follows the playback cursor. When you stop playback the insertion point position updates to the position of the playback cursor giving the same behaviour as a tape machine with playback continuing from where you last stopped playback. The shortcut to switch from one to the other is pressing N in command focus or if not in command focus press Cntrl + N.
If you think of an edit selection as a stretched out insertion point then the annoying experience of forgetting you have insertion follows playback enabled, pressing play, and losing your carefully set up edit selection when you stop playback makes perfect sense. The insertion point/edit selection position updates to the playback cursor position and you, therefore, lose your edit selection. You can’t fix this using Command + Z but Command+Option+Z will restore the previous edit selection - Very, very handy. Do I Need An Extended Keyboard For Pro Tools?